On 28th of March, the much-anticipated People’s March led by the Delhi University Teachers’ Association (DUTA) saw the participation of hundreds of students, workers, and teachers. The demonstrators raised an array of issues like the 70:30 funding formula, Self-financing of courses, Negative Pay and Service Conditions of teachers, attack on Reservation and Loan-funding through Higher Education Funding Agency (HEFA), etc. The march commenced from Barakhamba Road at 1:00 PM and finally culminated in a huge public meeting on Parliament Street at 3:30 PM. Before starting the march Manish Sisodia, who is the Deputy Chief Minister of Delhi and holds the Education portfolio, addressed the gathering. He expressed solidarity with DUTA and other student and staff associations. “This fight is not just yours or your teachers, it’s our fight. We all get affected by education. Today, from this platform, I pledge my, Aam Aadmi Party’s, and the Delhi government’s support to your cause.” he said. The demonstration that was peaceful and planned was closely watched by heavy police deployment. Students carried snazzy posters and expressed their anger in emphatic yet lively manner. 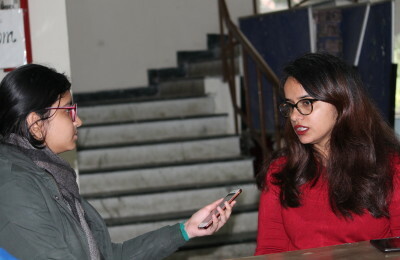 Predominantly the participation was from girls colleges, like Jesus and Mary College, Kamala Nehru College, Gargi College, and Lady Sri Ram College. Ramjas College, Sri Guru Tegh Bahadur Khalsa College, and Pannalal Girdharlal Dayanand Anglo Vedic College also participated in huge numbers. Busses stationed outside the colleges picked up students for the march. Teachers and students from Jawaharlal Nehru University, Ambedkar University Delhi, Aligarh Muslim University, Indira Gandhi National Open University, and Jamia Millia Islamia also joined the People’s March. The National Students’ Union of India (NSUI) members of Delhi University Students’ Union (DUSU) shared the stage with DUTA and other allied groups. Several representatives from political parties addressed the gathering at the end. Brinda Karat of Communist Party of India (Marxist), Sanjay Singh of Aam Admi Party, and Sushmita Dev of Congress. Some protesters were seen perturbed at the presence of politicians in a non-partisan protest. While this powerful and passionate march has evoked awareness about government’s policy amongst DU students, but whether or not this will result in constructive policy change can only be seen with time.